I think there is just one thing we want from this set of Arsenal players... it''s a response. Tomorrow night becomes even more vital because of the ramifications of Sunday's draw. It is perhaps the only way we can restore some pride in our season. A victory at the lane is what every Gooner is crying out for. I'm not sure there would be anything better than beating those lot at the present time. All the right noises are coming from the dressing room. "Of course we can still win the title. We still have to play United and they also have to play Chelsea. "They will drop points and we believe we're good enough to win every game from now until the end of the season. We believe we can do it." I'm glad the belief is still there. It certainly needs to be. But we are now walking a very fine line in terms of the title race and need some serious luck if we've got any chance of winning the league. And luck has been something that has been missing from our results in recent months. "I definitely still believe we can win the title. "We are confident United will drop points. We suffered after we lost to Barca in the Champions League. It was a hard two weeks for us and now the same can happen to United. "They lost at Wembley and then have a big Champions League semi-final coming up. Maybe that can put them off. "The other thing is, they still have to come to the Emirates. If we beat them, then maybe we can put them on a bad run. "Of course, we have to start winning games. It's six cup finals left. That's what makes the game against Spurs so big. It's massive." I know we can still mathematically win the league but we're going through a dire run of form, which couldn't of come about at the worst point in the season. We're struggling for goals and confidence. I just hope that Arsene Wenger and his back room staff have told these players how much tomorrow night's game with Spurs means to us Gooners. Only a win will do. I know many will have played in north London derbies before. But none will be as hardly competed as this. Spurs have just been eliminated from the Champions League and our season is on life support. The previous two league meetings have seen us lose, last time out a disastrous 3-2 defeat at the Grove, after we were 2-0 up. We need to fight for the victory until the final whistle. Jack has also stated his wish to play in next summer's Olympic Games in London. This boy really doesn't know when to say no! Yes, he's young and it's right that he wants to play. It would be more troubling if he didn't. But Arsene Wenger will have to sit him down and make sure he realises how lucky he is to play for Arsenal at the highest level. If he goes to the under-21s this summer he will be late back for the start of next season. He'll be going to the European Championships next summer with the full England side and then on top of that he wants to play the Olympics. That will be two full summer schedules. I know if Jack had said he didn't want to play it would have been a bigger story, but he's got to get some perspective on what he is and isn't able to do. He's not superman. Last weekend Cesc Fabregas at the age of 23, reached the milestone of 300 games for the club. That's a massive achievement for someone so young. Jack has to realise he'll need to rest otherwise he won't be able to perform to a high level every season and the main chance he'll get to take a breather is during the summer. He said post match he didn''t feel tired, but his last few performances haven't seen him play to his best. I just hope the boss will step in and make sure Jack knows how best to manage his career. He can't play in every tournament which comes along. 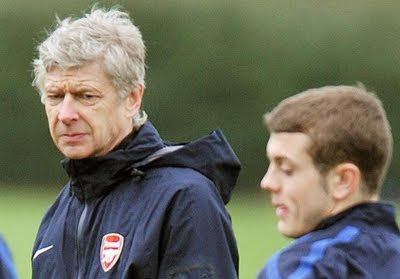 I think Arsene Wenger may have to break Jack's heart on this. Finally, I'd like to draw your attention to the release of a statement from the Arsenal Independent Supporters Association who give their thoughts on Stan Kroenke becoming the majority shareholder at the club. They also have a ten point plan for ticketing and loyalty which I believe the club should take up.